There are some things that just come so easily because they fit with your natural style. Like the way I felt the first time I traveled to France and found a romantic culture and design sensibility that spoke to my creative soul. Such is how I felt about my white Christmas tree. From the minute I set it up, I knew this new friend fit in seamlessly with my aesthetic. I also knew it deserved a place of honor in a light filled alcove at the front of the house. 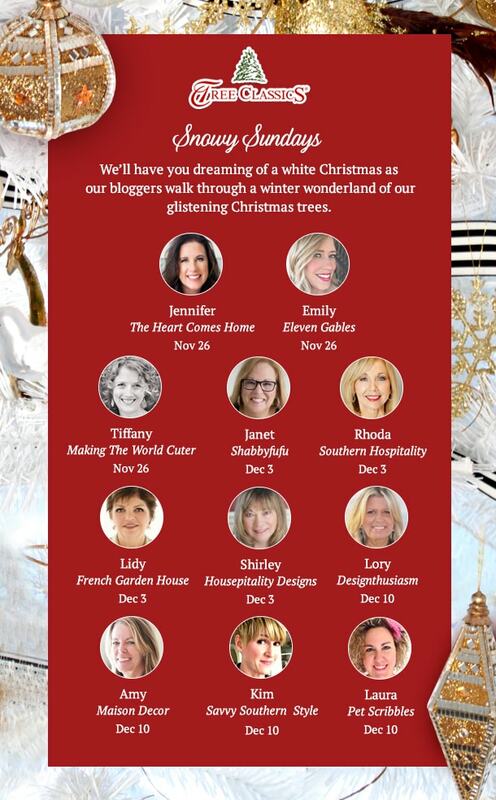 Today I’m joining with several bloggers as part of the Snowy Sundays event sponsored by Tree Classics. They’ve provided me with this lovely white tree and accompanying accessories, but all opinions come from my heart. The first thing I noticed about this exquisite tree is that it didn’t need much to dress it up. With the branches fluffed I could appreciate its lovely shape and with pre-lit clear lights, it’s quite beautiful on its own. 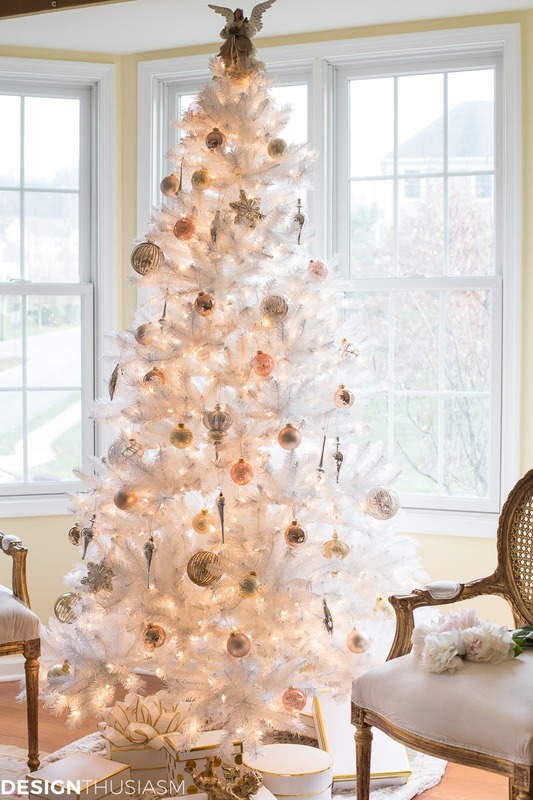 But, the whole reason I wanted a white tree was to work with my soft ‘go-to’ colors, so I enjoyed adding baubles in gold and silver, with pops of blush pink and rose gold. And if this ethereal combination wasn’t enchanting enough, when I went to the market for flowers I was delighted to find my beloved peonies! Yes, you read that right. 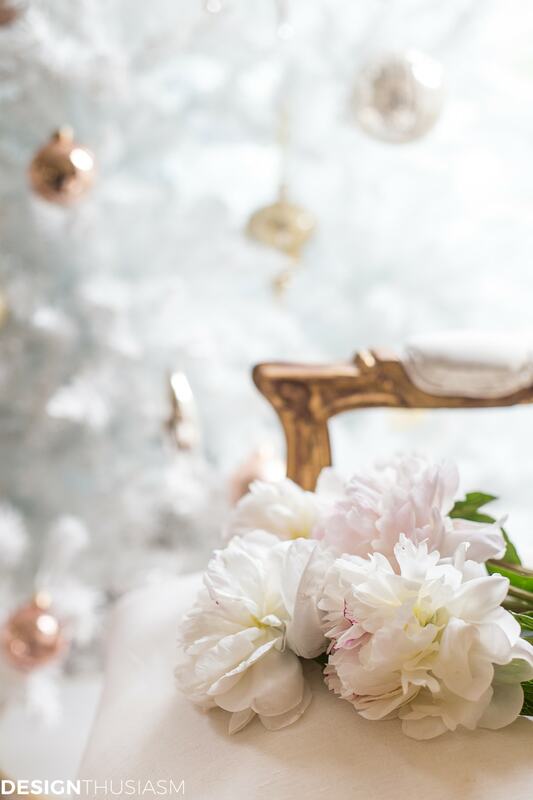 Fresh gorgeous peonies in December! When was the last time you found those on a snowy Sunday? When the kids were young, snowy days meant sledding and building snowmen outside. But these days I’d rather roll up on the couch and dream of decorating projects to come. The irony of this styling adventure is that I started out decorating a tree, but ultimately wound up decorating the room. As I had mentioned in my last post about our slim tree in the den, the bay window in the living room was just calling out for a tree. It was the perfect location with its alcove and view, but we had two large throne chairs inhabiting the spot. I moved them out and brought in the smaller French gilded dining chairs and it transformed the look of the entire room. I had already been thinking about updating the space, and this wonderful white Christmas tree wound up supplying the inspiration. I can now see exactly what direction I want to go in and I’m ready to follow my muse. 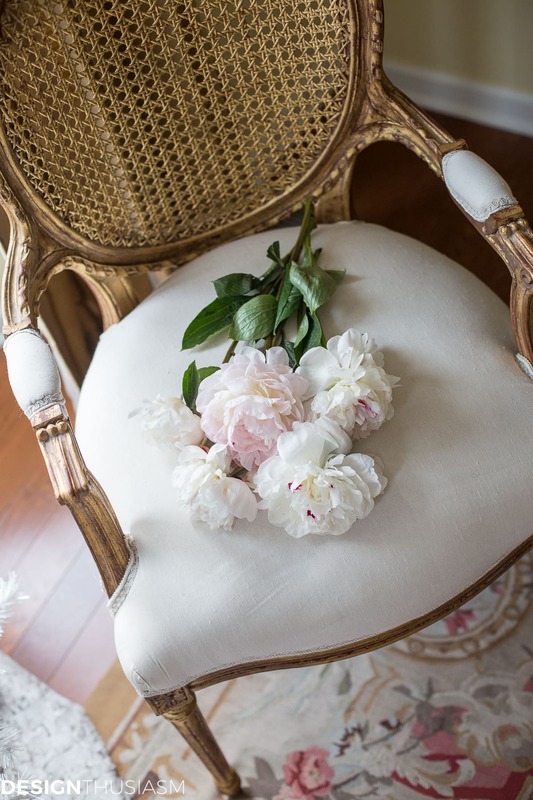 I’m crazy about whites and gilding, with soft touches of blush pink and faded rose. The aubusson rug can stay, and a few cherubs and antiques for sure. But with clean white as the foundation, both the tree and the room around it embody the modern French Country look I cherish. 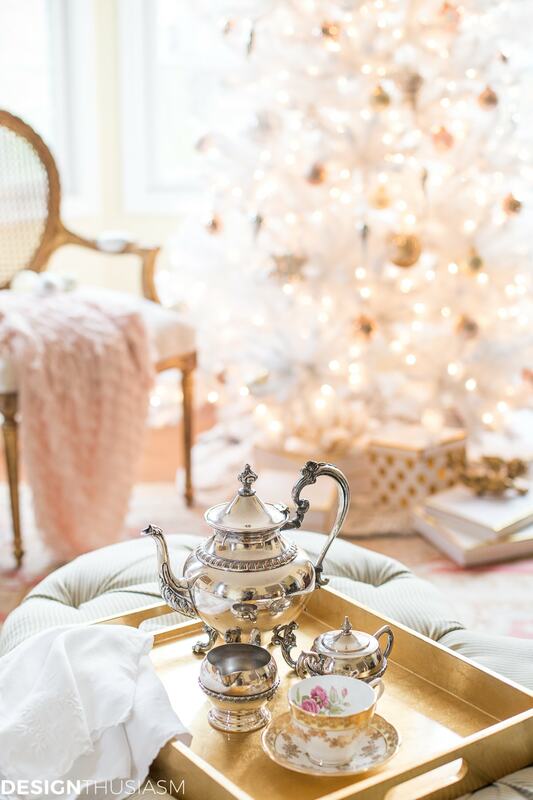 I love to mix vintage with modern, illustrated above by the gold lacquer tray with antique silver tea service. The charming tree lit in the background feels like it belongs and was always there. Presiding over the whole scene is a beautiful Silent Night Angel Tree Topper. The burlap trim gives it a homespun feel, a French Country detail that helps define this style. I can’t imagine another tree that would work so perfectly in this space. The look is soft and pretty, defined by gilding and glam accents balanced with chippy patina pieces. My home is constantly evolving and my passion for updated French style is unwavering. How lovely to have a pretty white Christmas tree to come along for the journey! Be sure to visit my friends below for more Snowy Sundays inspiration! Lory this is absolutely a stunner of a room, and the tree is exquisite! 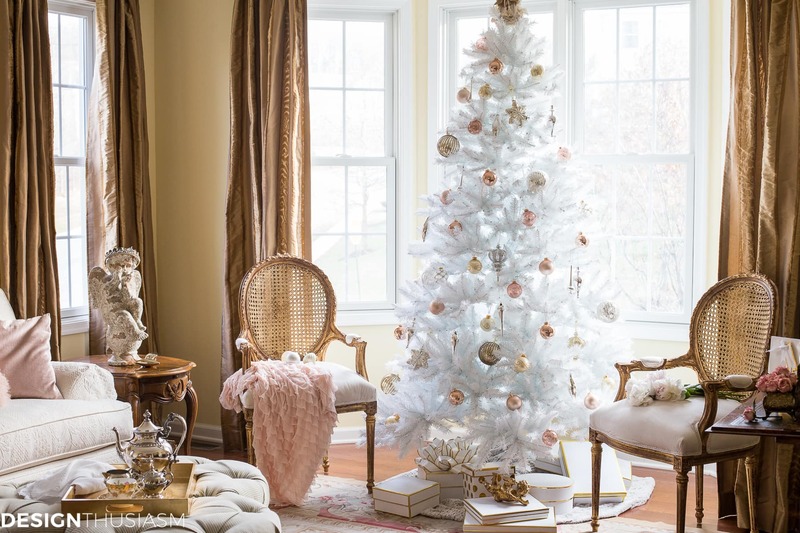 Love love love the gilded chairs setting off the snowy tree in the window. 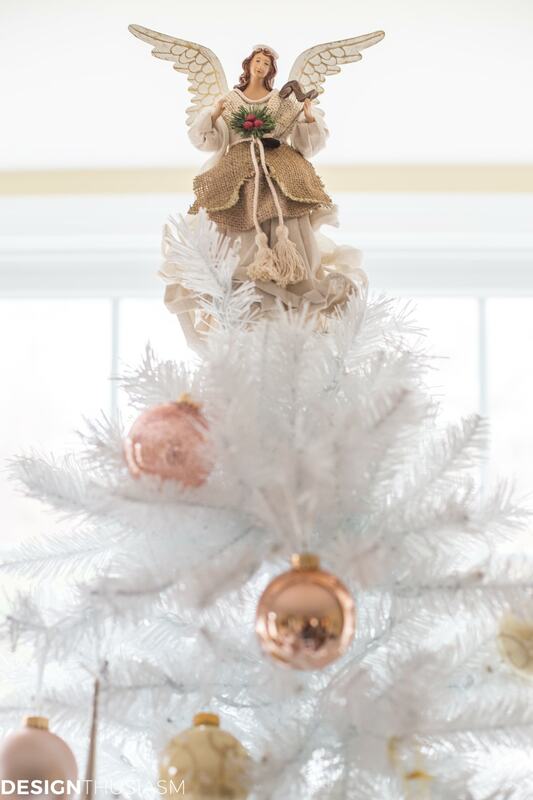 I just may have to get the angel tree topper for myself! Lory that is so beautiful in your bay window making such a statement. I love that any colors look so good with these white trees. 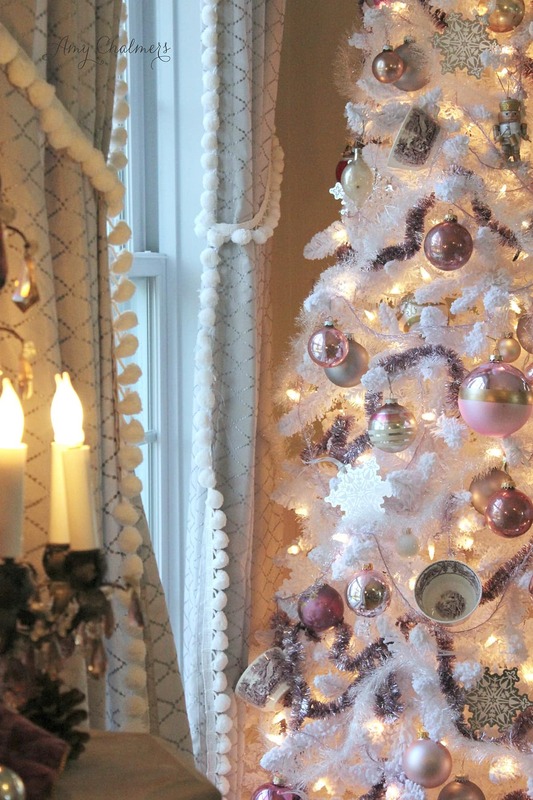 Oh Lory, I love blush pink and rose gold anything, so your tree is perfect to me! 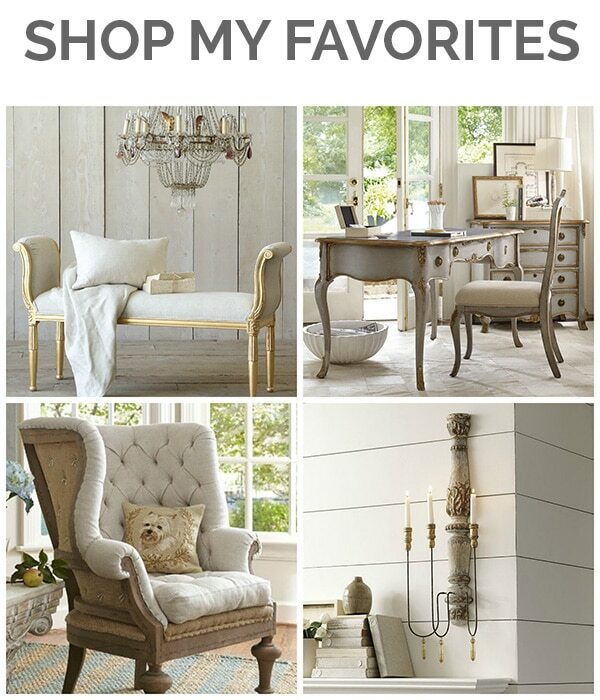 Seeing your home decorated so beautifully gave me so many ideas! I love your style! Merry Christmas early! Thank you so much, Laura, for the very kind words! And Merry Christmas to you, too!! So beautiful Lory! I am so loving the Blush this year!! 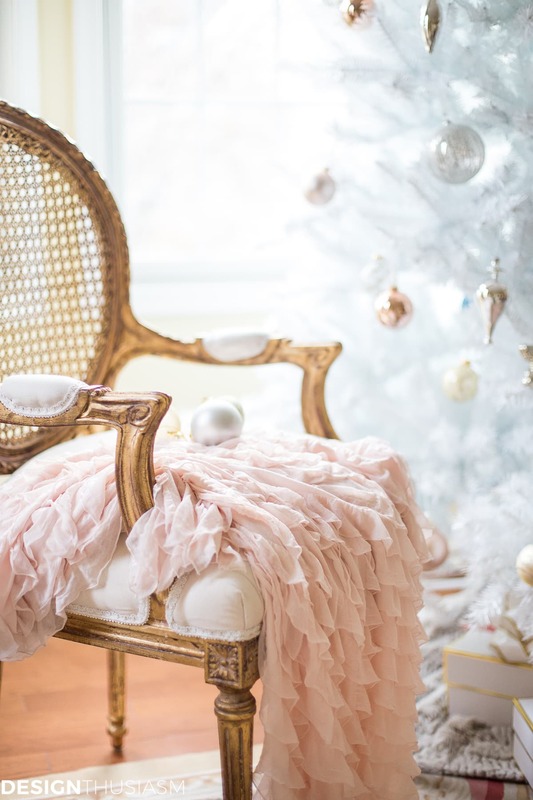 The gorgeous tree in the room just sets the beautiful tone for the Holidays….and must say that I adore that ruffled throw 🙂 … Happy Holidays Lory! Beautiful! I have had a white tree in the master bedroom (the most “french” room ) for many years, it is my favorite of the trees we put up. This year I used antique blush and gold ornaments. I have also used white and silver and silver and glass. So pretty at night. This year we added a flocked tree to our line up…also beautiful at night. Lory, the entire room is exquisite!!!!! 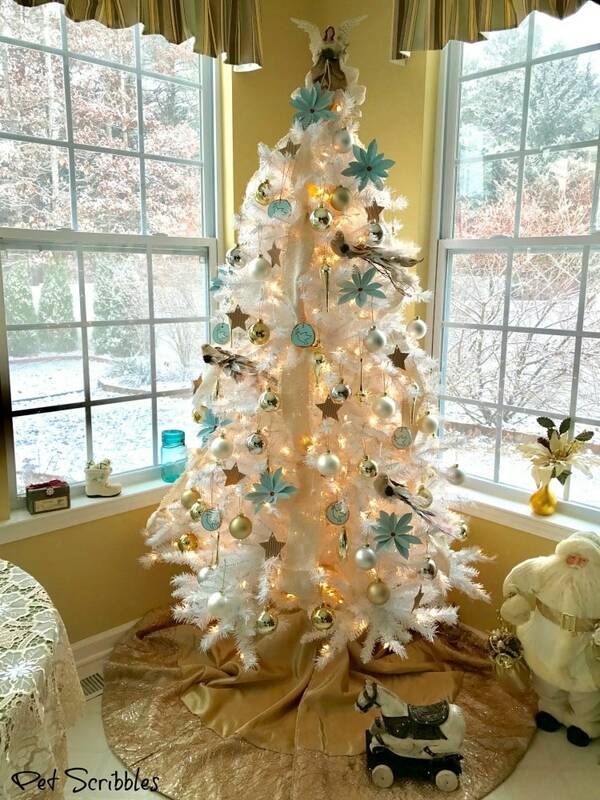 I have this color scheme for our white tree in the guest bedroom….added our Swarovski crystal ornaments to the mix this year and the tree just shimmers. 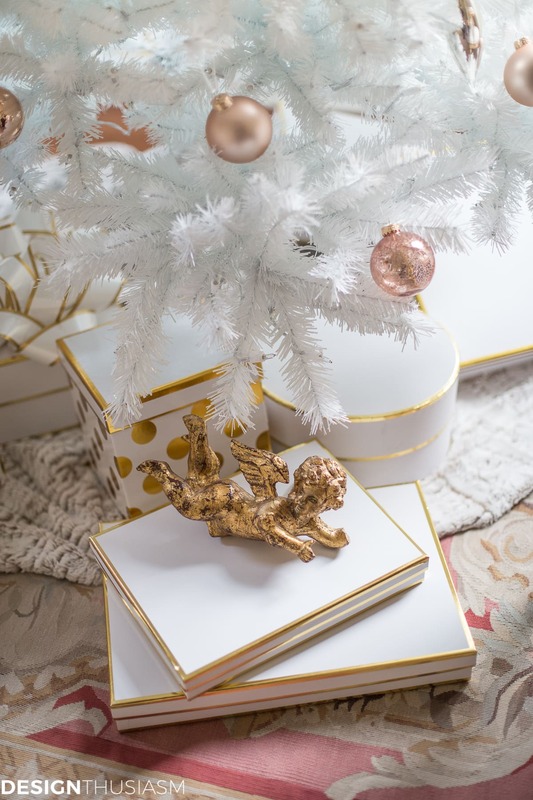 I use the same Target boxes when I put together our gold themed tree in the family room…love them and they also make for great gift giving! 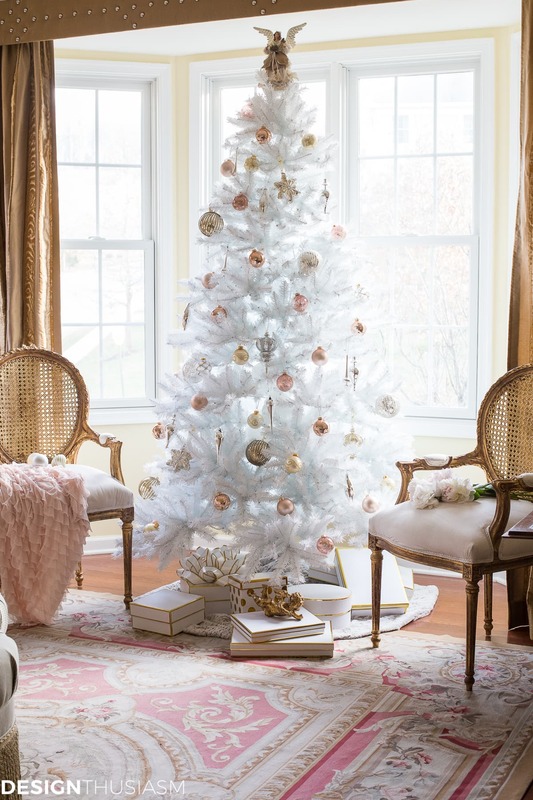 Your gorgeous chippy, gilded French chairs are dreamy and they go perfectly with the tree. I’m enjoying our snowfall that has covered all the hill and dale territory around us…looks like a Christmas card, Hugs! Oh my! That is magnificent! I have a white tree and I love it. I need to know about those curtains… are they custom made? 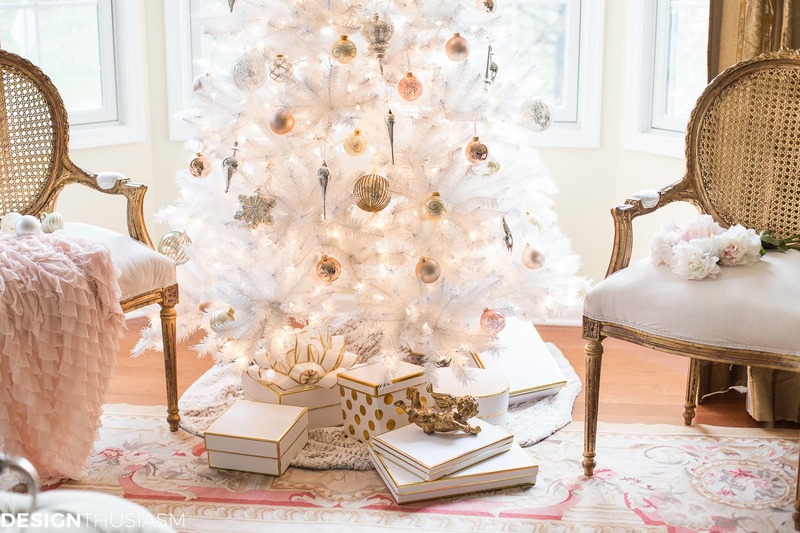 Lory, This room is gorgeous and the white tree in it takes it to the ninth degree of stunning! 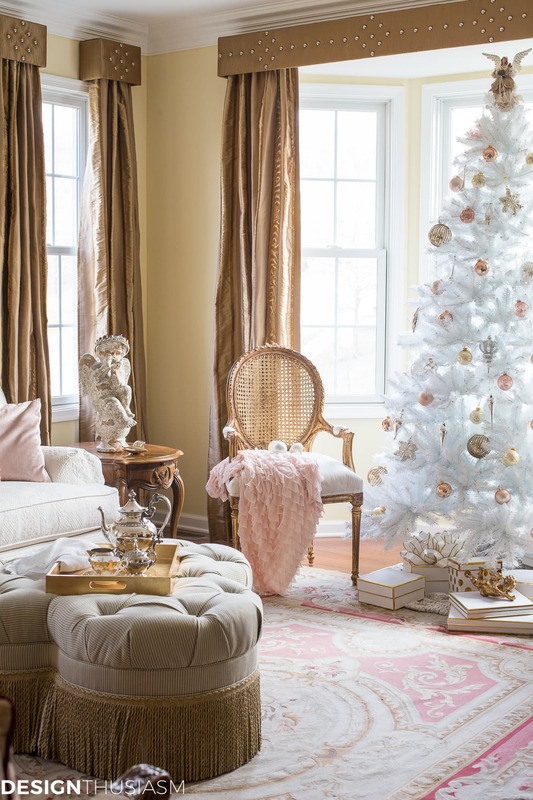 The blush and gold add so much to the tree and the room. Love this! Gorgeous tree. I did not think I would like a tree so sparsely decorated but it really works. It fits perfectly in your lovely French styled room. 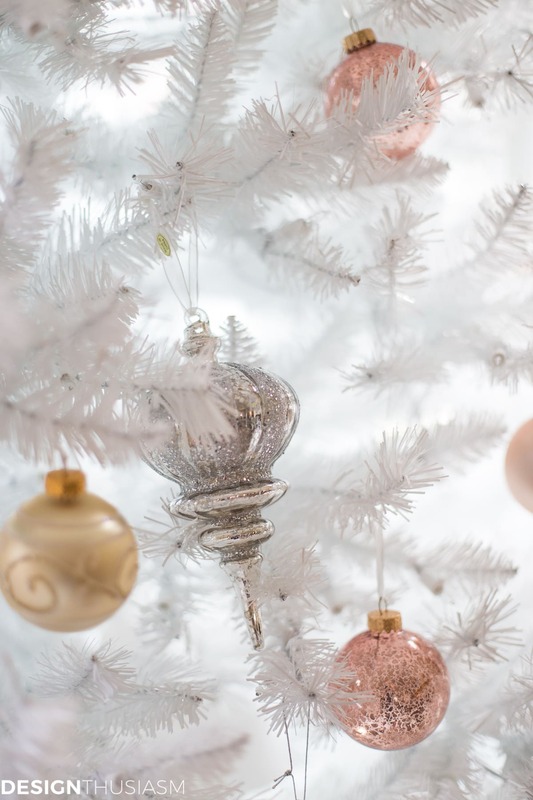 I have never considered a white Christmas tree, but if it is decorated this beautifully, I could definitely give it a try!